Here at Corona, we gather, analyze, and interpret data for all types of nonprofits. While some of our nonprofit clients are a little data shy, many are data-heads like us! Indeed, several nonprofits (many of which we have worked for or partnered with) have developed amazing websites full of easy to access datasets. Here are 4 of my favorite nonprofit data sources…check them out!! Not only do they sponsor Mile High Data Day, but the Piton Foundation produces a variety of user friendly data interfaces. I really like the creative ways they allow website visitors to explore data–not just static pie and bar charts. Instead, their interface is dynamic and extremely customizable. While their community facts tool pulls most (but not all) of its data from the US Census, this tool is very easy and fun to use. Further, they have already defined and labeled neighborhoods across the Denver Metro area, making it easy for users to compare geographies without trying to aggregate census tract or block group numbers. This is an invaluable feature for data users who don’t have access to GIS. I also appreciate the option to display margin of error on bar charts when its available. 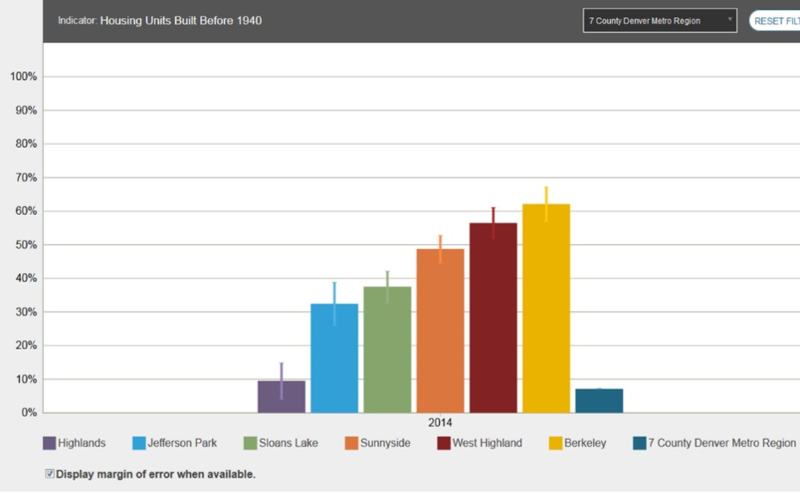 With over 1,500 datasets, OpenColorado is a treasure trove of raw data. While this site doesn’t have a fancy user interface, it does provide access to data in many different file types, making it a great website for the intermediate to advanced data user with access to software such as GIS, AutoCAD, or Google Earth. Most data on OpenColorado is from Front Range cities (e.g., Arvada, Boulder, Denver, Westminster) and counties (e.g., Boulder, Denver, Clear Creek), but unfortunately it is far from a comprehensive list, so you’d need to look elsewhere if your searching for information from Arapahoe County, for example. There are over 200 datasets specific to the City and County of Denver. I opened a few that caught my eye, including the City’s “Checkbook” dataset that shows every payment made from the City (by City department) to payees by year. I give kudos to Denver and OpenColorado for facilitating this type of fiscal transparency. I also downloaded a dataset (CSV) of all Denver Police pedestrian and vehicle stops for the past four years, which included the outcome of each stop along with the address, latitude and longitude. For a GIS user, this is especially helpful if you want to search for patterns of police activity compared to other social and geographic factors. Even without access to spatial software, this dataset is useful because it includes neighborhood labels. 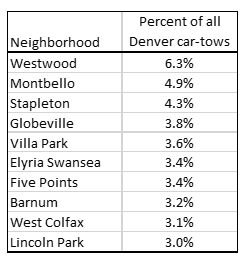 I created a quick pivot table in Excel to see the top ten neighborhoods for cars being towed (so don’t park your car illegally in these neighborhoods). Kids Count is a well-respected data resource for all things kids. Each year, the Colorado Children’s Campaign (disclaimer, they are also our neighbor, working just two floors below us) produces the Kids Count in Colorado report, which communicates important child well-being indicators and indices statewide and by county when available. The neat thing about Kids Count is that it’s also a national program, so you can compare how indicators in a specific county compare to the state and nation. In addition to the full report available as a PDF, you can also interact with a state map and point and click to access a summary of indicators by county. Mostly, their data is not available in raw form, but their report does explain how they calculated their estimates and provides tons of contextual information that makes their key findings much more insightful. If you’re looking for information about outdoor recreation of any type in any state, there is probably an Outdoor Foundation report that has the data you’re seeking. Based in Boulder, Colorado, the Outdoor Foundation’s most common reports communicate studies of participation rates by activity type, both at a top level and also by selected activity types such as camping, fishing, and paddle sports (haven’t yet heard of stand-up paddle boarding? It’s one of the fastest growing in terms of participation). The top-line reports show trends over the past ten years, while the more detailed Participation Reports break out participation, and other factors such as barriers to participation, by various demographics. Multiple other special reports, focusing on topics such as youth and technology, round out what’s available from this site. The participation and special reports are helpful, but I’m most impressed with the Recreation Economy reports, which are available nationwide and within each state. These reports estimate the economic contribution of outdoor recreation, including jobs supported, tax revenue, and retail sales. For example, the outdoor recreation economy supported about 107,000 jobs in Colorado in 2013. Unfortunately, the raw data is not available for further analysis, but the summary results are still interesting and helpful.